Well, if you are gardening in the UK then the chances are high that you have planted potatoes with a name that begins with the word 'Pentland' - well that is where I am today, the Pentland Firth is a channel of water just North of the most North Easterly part of the UK. From here we get the finest Scottish seed potatoes with names such as Pentland Dell, Pentland Crown, Pentland Javelin...oodles more! The best virus free seed potatoes come from here because it is just too cold to suffer blight or other fungal diseases. Tomorrow we are parking under the Forth Bridge and arriving at South Queensferry for a day trip to Edinburgh Castle. If any keen-eyed bloggers on the East Coast of Britain want a view of the Queen Victoria on Saturday morning, the Captain has promised that he will bring us close into the coast near Scarborough and Flamborough Head at about 7am on Saturday morning as we travel South back down to civilization! Currently sailing round the UK on the Cunard liner Queen Victoria. Saturday had a wonderful day in Cobh where I met Peggy from Organic Growing Pains. (photos when I get back). Sunday in Dublin, yesterday in Liverpool where I was honoured to meet HRH the Duchess of Cornwall on board (lovely lady). As we sailed out of Liverpool after her maiden visit, the Captain of the ship decided to have a horn honking competition with the Mersey Ferry!! Today I was in Belfast, drove all the way up the spectacular Antrim coastline to the Giants Causeway. Fantastic day. Tomorrow is Glasgow and a visit to a whisky distillery in Glengoyne and Loch Lomond. I do get around! There is an anxious time in every gardeners year, this is when you go on your Summer holidays. So many things to do, worry about who will water the plants, how big will the courgettes get? If veggies are not picked then they will probably stop cropping. The fruit on my plum tree has just started to ripen all at once! pounds and pounds of lovely sweet eating plums will not wait for me to get back. Today I picked them all (thank heavens for dwarfing rootstocks!). Halved them and bagged them up in ziploc bags in the freezer. Ready for jams, pies or crumbles when I get back. Maggoty plum ratio - about 1 in 20 - not bad! One small success is my first crop of Hinomaki Red gooseberries. A two year old bush having its first crop this year. Stunning to look at and very sweet. Quite promising for next year. So, dear readers, Buddy is going into kennels while we are away. I must admit to being a little anxious this time as he is now 14 years old and just beginning to show his age a little. He is an outgoing, confident chap and I am sure that he will make friends easily. I am off sailing around the UK, Scotland and Ireland on the Queen Victoria. I am excited to be meeting a fellow blogger Peggy in her home town of Cobh, during my very first visit to Ireland, having only corresponded via her Organic Growing Pains blog. I will be dropping in for one day to say hello - in person! I will be back on August 1st. Different varieties of climbing beans are just starting to crop. The secret of tasty and tender beans is to pick them while they are still small. This probably means going out every day and picking because they grow so quickly this time of year. Last night these beans were cooked for 5 minutes then tossed in butter and garlic! Yum! These lovely thin beans are an old variety Lazy Housewife. I first saw these growing down in Cornwall at the Lost gardens of Heligan. They were a popular variety in Victorian England. Despite earlier setting problems these are the first runner bean St George to get to eating size. It is especially important to pick runner beans when they are small and tender. You wait any longer and they are stringy and tough. This experience will put a child off eating them for life! Another old heritage variety survived being eaten by my dog Buddy! These are Mrs Fortune's climbing beans. We've had a tiny amount of rain in the last couple of days but it just dries up immediately and does no good to the garden at all. You might remember to keep water in the birdbath for the birds but I have been noticing the number of honey bees drinking in my birdbath at the moment. Most of the time now there are 3 or 4 bees at a time sitting on the wet edge of the birdbath drinking water. I assume they have been going back to their hive and doing their 'bee dance' telling the other bees where there is a supply of water. Your birdbath is not just for the birds. Make sure there is a shallow, wet side for the insects as well. I've picked my first batch of this old heritage variety Salmon Flowered Pea. They are very easy to shell, they pop open easily. There are between 3 and 6 peas in each pod which isn't a lot by modern standards but you would expect this from an older variety. They are a lighter green colour than some other peas. I wasn't struck by the flavour and texture when they were cooked though. For me, they tasted similar to a marrowfat pea and had quite a dense, grainy texture. Not the best tasting pea. I will be saving the rest of the crop on the vine to dry to use for seeds. Meanwhile in the greenhouse I am thrilled with this Tiffany F1 cucumber. There are lots more to come! This is an all female variety so there are no male flowers at all. These Country Taste beefsteak tomatoes are doing well in the greenhouse. I am trying to keep them well watered and fed, but in this heat it is difficult to get the balance right in a hot greenhouse. As my strawberry crop for this year is now finished I have pruned them right back to allow the second set of leaves to grow. This is an essential part of strawberry maintenance. This second set of leaves feed the crown in order to produce leaves next year. Cut them right back and give them a good nitrogen feed to get the leaves growing strongly. Who's Eating my Beans Again? My heritage beans 'Mrs Fortunes' have just started to crop. These lovely purple specked beans are coming thick and fast now. But there is a problem... Something has been eating the leaves. Blog readers were kind enough to suggest who might be a culprit for eating my runner bean flowers so I thought I might put it out to you to see who it is this time. Was it slugs? blackbirds? snails? deer? Great big chunks of leaf are disappearing at the base of the plant. Previously with my runner beans I had been wondering why the flowers weren't setting, I thought they were being eaten. One of the suggestions was that the dry weather didn't suit runner beans who like a moist atmosphere to aid pollination. We haven't had rain here for months, so I started spraying the runner bean foliage each day as well as keeping the roots wet. And hey presto! runner beans have set! A moist atmosphere helps the flowers pollinate and the runner beans have been setting. So why are my climbing beans Mrs Fortunes being eaten? Buddy loves veggies! every so often he just nibbles some greenery! Look at all this wonderful Summer fruit! I just cleaned the fruit and put it in a bowl in the microwave with a spoonful of sugar to cook for just 5 minutes. Absolutely no water is needed. Line a basin with plain white bread. When the fruit and the juice has been put into the basin then make a top for it. But is was all gone! Here in London we had the hottest day of the year so far. Way up in the 90s. The most sensible place to be on a hot day like this is on the coast. 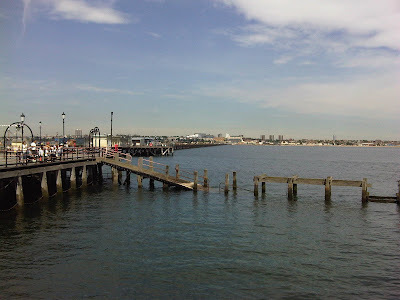 If you live in London then the nearest option is to take a trip out East to the Thames Estuary to the town of Southend on Sea. 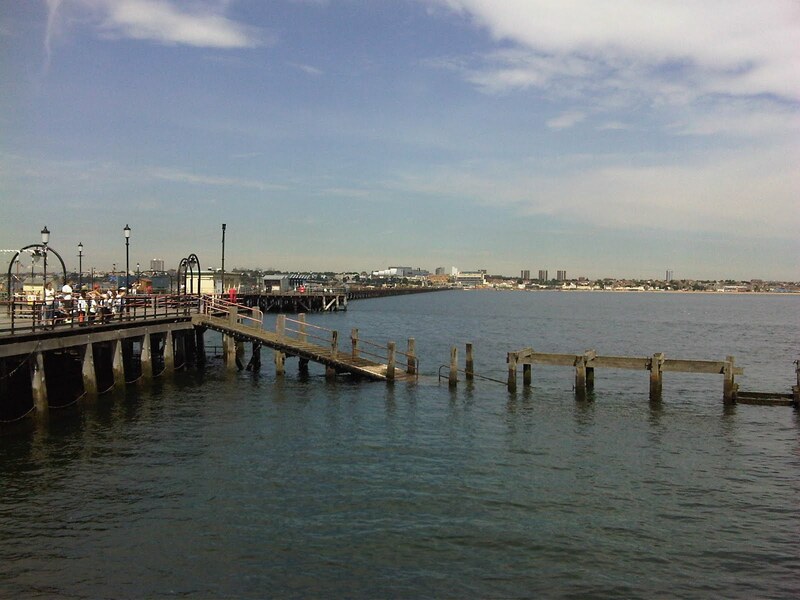 The pier at Southend is the longest pier in the world at over a mile long. This morning I walked out to the end of the pier to see what was going on. Thank heavens for a lovely sea breeze or that heat would really scorch me today. There is a small train running up and down the pier which was built in the 19th century. Traditionally working class Londoners would treat themselves to a trip out to Southend. My Mother tells me that as a young girl in the 1930s she would take a paddle steamer from Tower Bridge to Southend once a year as a special treat. The boat moored up at the end of the pier. Beautiful views all over the Thames estuary from the end of the pier. Today an old 3 masted sailing ship Atlantis was moored at the end of the pier and will be taking people out for sailing trips this weekend! Next I took the train 2 stops down to Leigh on Sea. I have wanted to come here for many years ever since I saw the TV chef Rick Stein come here for his food heroes series. Here at the Crooked Billet pub you can drink a very fine selection of guest English beer overlooking the sea. 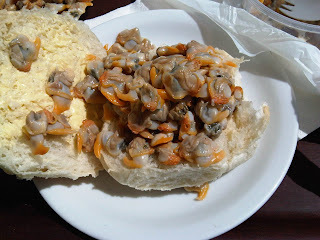 Whilst enjoying the fresh seafood which is landed daily at this busy fishing village. The speciality here is cockles. So I sat and watched the fishing boats in the estuary, drank a pint of my favourite English beer 'London Pride' , ate a cockle sandwich and watched the seagulls. If you ever get a chance to visit this part of the Essex coast here on the Thames estuary you cannot get better than a visit to Leigh on Sea. This is a heavenly place for seafood lovers. Every other shop sells cockles, mussels, whelks, jellied eels, shrimps.... everywhere. A small lane at the end of town is called 'Cockle Shed' where there are row upon row of 'Cockle merchants' - do you imagine that someone has a passport, and at the back where you fill in your occupation they have written 'Cockle Merchant'?? - just a thought! And there are mountains of cockle shells here too. Ground up to make chicken grit and soil fertilizer I suppose. Blog posts are coming thick and fast at the moment. So much is happening on my patch, it is the time of year when the garden is most productive. All this soft fruit is ready all at once. Collectively known here as 'Summer Fruits' I think a spoonful of this is headed into a smoothie (I'm not a great fan!) the rest will, of course, be put into a Summer Pudding. Loganberries are amazing! Just once a year I cut back the current year's shoots and tie in next years. About 10 minutes work and that's all I have to do in a whole year! These loganberries are growing in a shady corner under the bramley tree so the birds haven't discovered them yet. The Loganberry is a cross between a blackberry and a raspberry. It was originaly bred by an American Lawyer James Harvey Logan in the early 20th century. Until now I thought that it was usually too sharp to eat raw, and I always cooked them. Until yesterday... I had forgotten these and they have stayed on the stem and properly ripened to a darker pink colour. The taste is wonderfully sweet and rich! Not all of them survived to be cooked!! I have just a few small strawberries left, gooseberries are not good this year due to sawfly and drought. Raspberries are brilliant because I have been making sure they are well watered. Blackcurrants are good because they enjoyed the cold Winter, as did the redcurrants. I just picked these over, gave them a very short rinse and with a spoonful of sugar put them in the microwave for just 5 minutes. Heaven! Who's Been Eating my Beans? I kept looking out for signs of my first runner bean St George after such a wonderful show of flowers, but they just didn't come... Then upon closer inspection all I could see were little stalks where the pollinated flowers should have been growing little beans. Just this one baby bean is visible. Now who could be eating my beans? Slugs? Snails? Birds? Mice? Does anyone have any ideas? Better news elsewhere. Here are my very first tomatoes of the year. These are Sungold tomatoes grown in the greenhouse. They tasted fantastic, the long tomato gap is finally over! Courgettes are really going well, left to right, Defender, Black Forest, Soleil. Picked, photographed, steamed and eaten all within 10 minutes! Yum!